Get ready, this is another one of my very truthful post, with good intentions -that the place will improve and not close down because in Penang, we need places like these. So, if you can’t take criticism or you think I have insulted your opinions (as in the opinions of other food bloggers) then, you better click the red box with x on your left or right (depending on whether you use Windows or Mac) now and forever hold your peace. Otherwise, read on…. 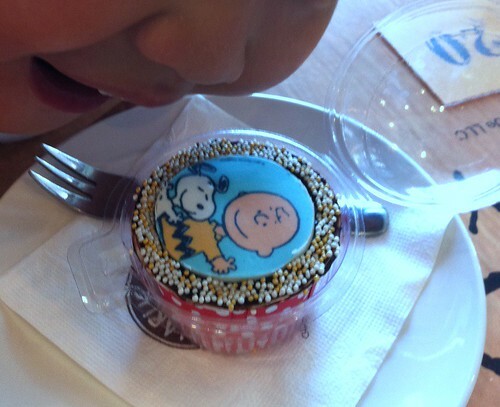 I heard so much about people raving on Charlie Brown Cafe at Straits Quay Penang. People take cutesy pics and said it is cute, it is so pretty, it is so special yadda yadda yadda. 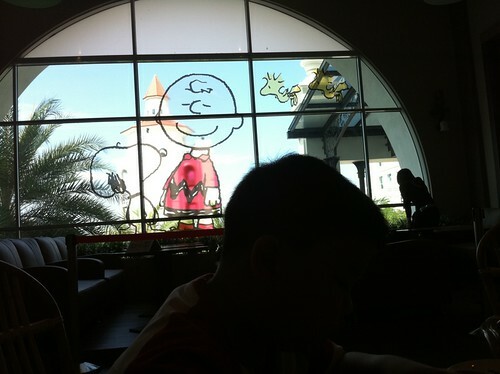 Charlie Brown is something in Straits Quay, which is very near my home. So, one afternoon, I decided to drop by with my little boy for an afternoon tea. Just the two of us. The first thing that made me fed up is how they expect us to queue up at the counter. Without any menu on board but only given to us when it is our turn. So can you imagine how long it is going to take others who are not familiar with the place to choose what they want? Secondly, when it is our turn, I found out the girl at the counter doesn’t speak English or Hokkien. What a turn off. I told her, One hot dog with no mustard, no ketchup and no vegie. She looked at me blankly. And me being me, is already pissed off. One Indian staff quickly came to her rescue. So, I muttered again, One hot dog, no mustard, no ketchup, no vegie. Like doh..is that so difficult to remember? And I have to repeat one by one. So, the cute cupcakes caught my son’s eyes. And I ordered one for him. It turned out to be nothing special except for that sugar cartoon on top. At the end of the meal, I found out it costs RM12 plus plus, if I am not mistaken. Even my 8 yrs old know that RM12 for a tiny cupcake is expensive. Go figure…. 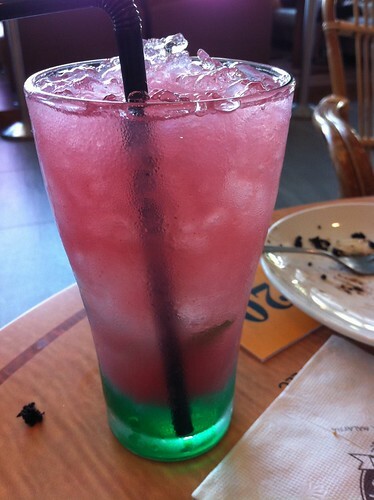 Then, they have some fancy-schmancy drink. And this also cost about RM10. It is nothing but canned guava juice with some ugly looking syrup. I ordered the pasta and that’s what super pissed me. It is not cheap either and at that price, I expect some decent pasta because it is seafood cream sauce. Guess what? It comes with stinky frozen squid, some shrimps, fish and these ugly looking things which are supposed to be clams. It is tinier than our siput lala. I was like…wth, who do Charlie Brown bosses think we are? Those pasta are so overcooked it is limpy and soggy. The sauce is from canned or powdered stuffs. There is not a sign of any herbs or olive oil. OK, I may be a bit critical but those aren’t suppose to be the kind of quality served by outlets from prestigious place like Straits Quay. I am sure the bosses must have spent millions on the renovations but they hired several Indonesian staffs who yawned and delivered the wrong order, forget to bring the cutlery and etc etc. They hire locals who can’t speak English nor Hokkien, which is Penang’s dialect. And I wonder who are behind in the kitchen, serving such foods? So, dear bosses, are you serious in doing business? Blek, please improve before all the first time customers run away and never return. And to those food bloggers who yapped about how nice the place is, please lah…. just mark the day on yr calendar and start the countdown to its demise! places like this do not deserve to be in business. that said, i’ve yet to experience good service in Penang. and yes, i’m from Penang. I been there few weeks ago with my family. Sipeh teruk for a food outlet that is located at Strait Quay. Service teruk and food teruk. People that visit there just want to take photos. When I were there, I see people are so so busy taking photos here and there. Once experience and I will not be back again unless something happen and catch my attention. Wow that’s sad and with such anticipation for it’s opening as well.